Make your caravan awning a home with optional additions available for the 2019 collection. 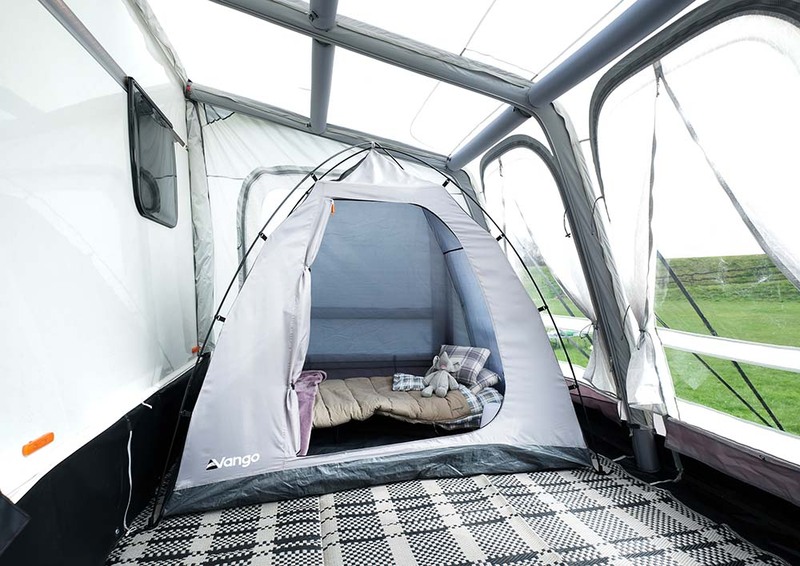 From fitted carpets, to annex's and porch doors to expand the living space of your awning, we have an abundance of new and updated optional additions for your Vango awning to make your outdoor space even more homely! Fitted carpet for your caravan awning. Provides comfort and warmth inside your caravan awning and keeps your furniture from gaining wear and tear on the ground. Specifically designed to not only match your caravan awning but also to protect grass on the campsite. We have a variety of sizes to match your awning! Creates an addition bedroom in your awning. The new for 2019 Free-Standing Bedroom is a fantastic addition to any Caravan or Vehicle Awning, providing an extra space for guests, storage, or even as a private area for changing. Simple to assemble and able to fit in all vehicle awnings, caravan awnings, or even our family tent collection! Collection of storage options to hang inside your awning from the SkyTrack II® System. The Vango SkyTrack II® System is a brand new, built in addition to all caravan and drive away awnings in the 2019 range, offering handy lighting solutions and extra storage options! The track is fitted to the beam sleeves inside the awning, providing a smooth channel for our Sky Hooks and SkyLiner's to simply attach and detach when necessary. 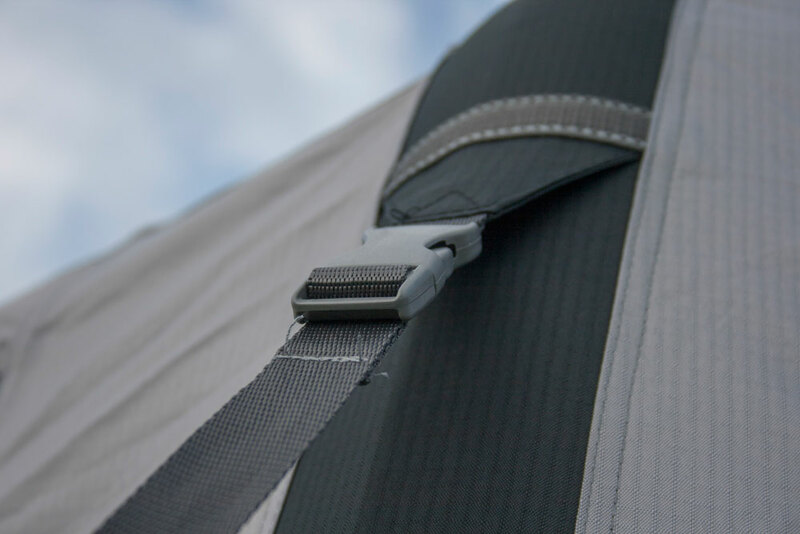 Designed to integrate seamlessly into the tent using Vango’s unique SkyTrack II® System. Perfect for holding shoes, books, hats or whatever you may want to tidy away and keep off the ground while on your travels! The Sky Storage collection consists of smaller models such as the 5-pocket organiser and storage basket, or larger pieces such as the 8, 9 and 10 pocket organisers, allowing you to choose from a variety. This feature is ideal for adding some extra storage to your awning, without buying a full unit. 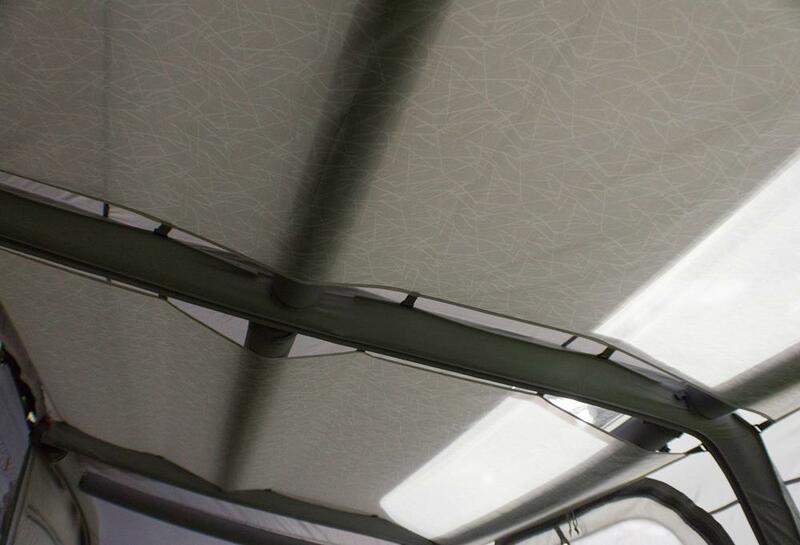 A SkyLiner is an internal fabric layer that attaches to the ceiling of your awning. 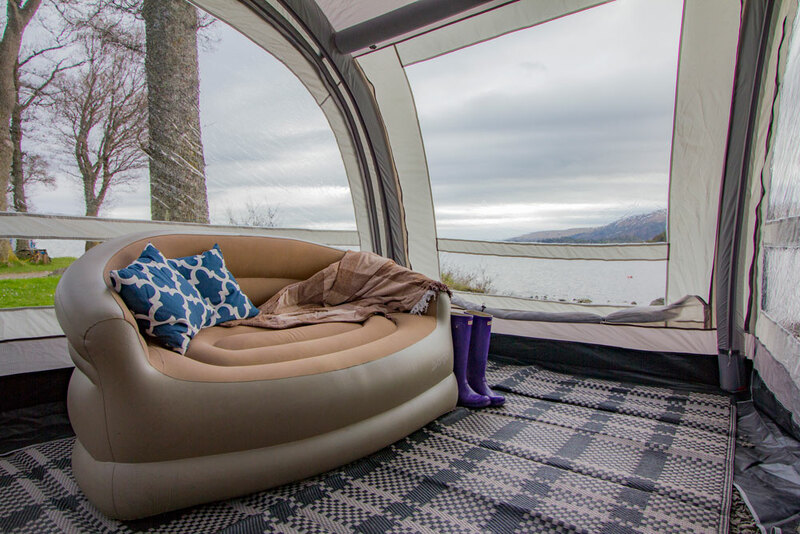 The SkyLiner provides a layer of air between your living space and awning ceiling, ultimately reducing the effects of condensation and creating a thermal barrier in cold weather. They can also cover the ceiling skylights should you want extra privacy or shade from the sun. Vango SkyLiner’s slide effortlessly onto the built-in SkyTrack II® System in your awning with pre-attached SkyHooks. They are soft to touch and made-to-measure for each specific caravan or drive away awning for 2019, therefore these cannot be used in collections from 2017 or earlier. Not only can you buy additional storage for your SkyTrack II® System, you can also attach lights to this channel, by simply sliding on your Sky Hooks (provided with awning) and attaching a lantern or Sunbeam system, to create a home from home look and feel. This also keeps lights and lanterns off the ground or tables, giving you more space to relax inside your awning, and creates an ambient light at night for relaxing. Robust straps to secure awning further in bad weather conditions. Storm straps provide secure guying out at the front of your awning to enhance stability, meaning there is no need to worry about adverse weather conditions. Simply clip onto the pre-attached clips on your awning and peg into the ground just like guylines! AirSpeed tube to replace original beam(s) should anything go wrong, always a great ideal as a backup just incase. If in the unfortunate event one of your beams develops a puncture, we have a variety of replacement beams for the whole Vango awning collection. They are very simple to replace, making sure you can get on with the rest of your holiday with no stress! As mentioned, we have a vast variety of different beam sizes, so make sure you have checked which beam is suitable for your caravan awning. If you aren’t sure how to replace a beam, check out our video on how to replace a beam in your awning. Covered extension for the Varkala Connect to extend living area. 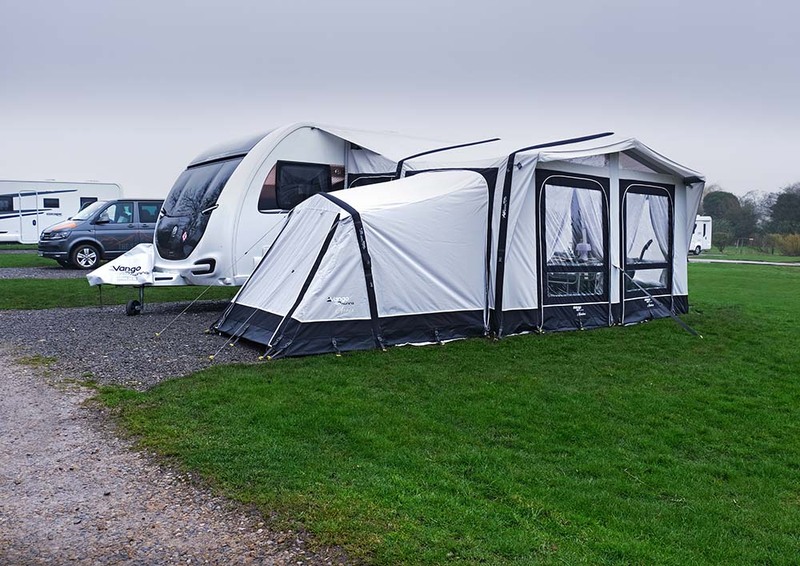 Brand-new to the 2019 caravan addition range, the Varkala Connect Porch for left or right-hand side creates the perfect entrance to your awning. Ideal for sitting out in lovely weather, sheltering muddy boots or cooking up a BBQ at night. There is a left and right-hand side attachment available for the Varkala Connect, allowing you to have either 1 or 2 attached at a time. The Porch is easily pumped up with a single beam and zipped onto the side of your awning, meaning you don’t need an extra long awning rail to attach it to. When not in use, the Porch can be easily detached, allowing versatility whatever the weather. Fully enclosed extension for the Varkala Connect to provide extra living space. A fantastic and must-have addition for the brand new Varkala Connect is the Connect Extension, allowing you to create a larger living space whether you are away for a short weekend getaway or a month-long trip! The Varkala Connect is one of the most versatile awnings on the market, offering the ability to add on a left or right-hand side connection or even both for the ultimate outdoor living space! Fitted carpet for the Varkala Connect Extension addition. Provides comfort and warmth inside your extension and keeps your furniture from gaining wear and tear on the ground. Specifically designed to not only match your caravan awning but also to protect grass on the campsite. The Varkala Connect Extension carpet is made to measure for your addition. Expand your living area for the Varkala Connect. The new Sun Canopy creates a robust shelter for rain or sun shade, allowing you to enjoy your meals or simply lounge about in the great outdoors. Simple and hassle free to pitch, this Sun Canopy is made to measure, making sure it fits your Varkala Connect perfectly. The handy clips easily attach onto your awning and the three included poles can be adjusted to suit the terrain level. The Sun Canopy is also suitable for the Somerby Caravan Awning. The porch door is an attachable front extension to create an enclosed area. For that extra bit of living space and covered front entrance, the Sonoma porch door is the perfect addition to your Sonoma! This allows your front entrance to be fully enclosed to protect further against the elements and an ideal area for living or storage. The Sonoma porch door can be simply zipped onto the front of your awning and features only one AirBeam®, meaning it can be pumped up quickly and easily to let you get on with your holiday. This porch door is specifically designed for the Sonoma collection, therefore will not be suitable for any other awning in the Vango range. Creates an extra sleeping or storage area. 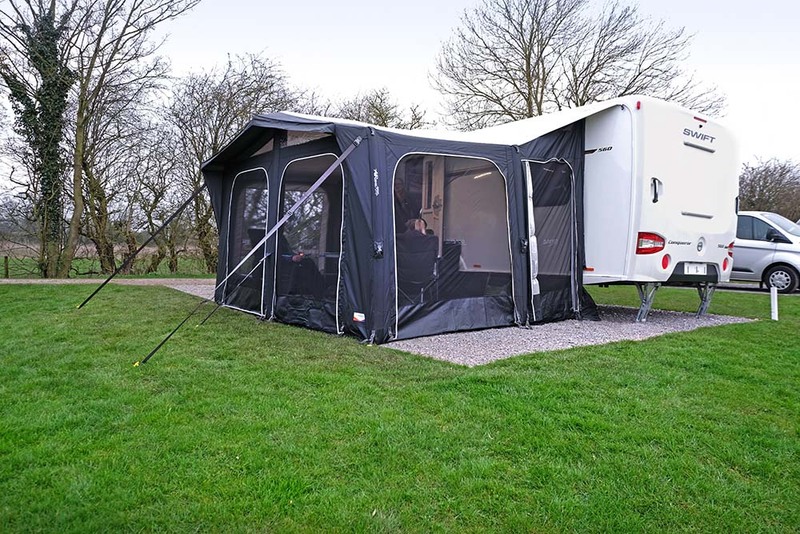 Whether you have invited some extra guests on your caravanning trip or just need some extra room for luggage and equipment, an Annex could be the perfect addition to your awning. 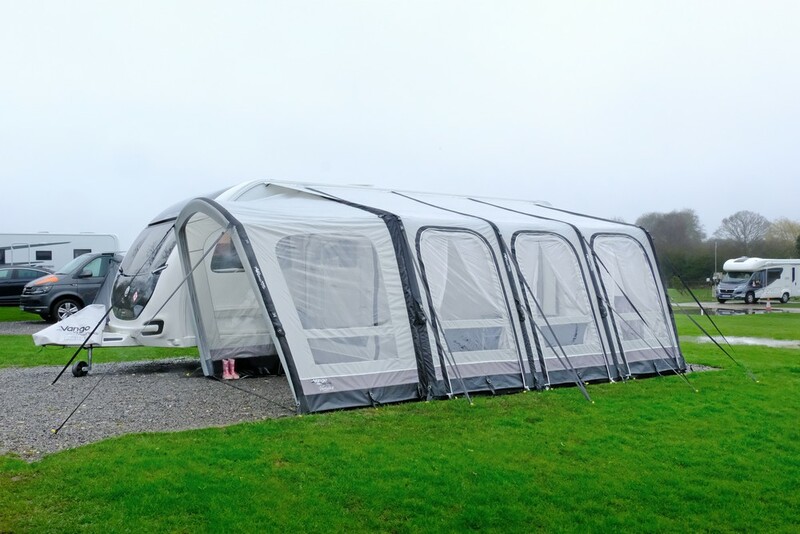 The Annex simply zips on and off your caravan awning and has only one AirBeam® for ease of pitching! 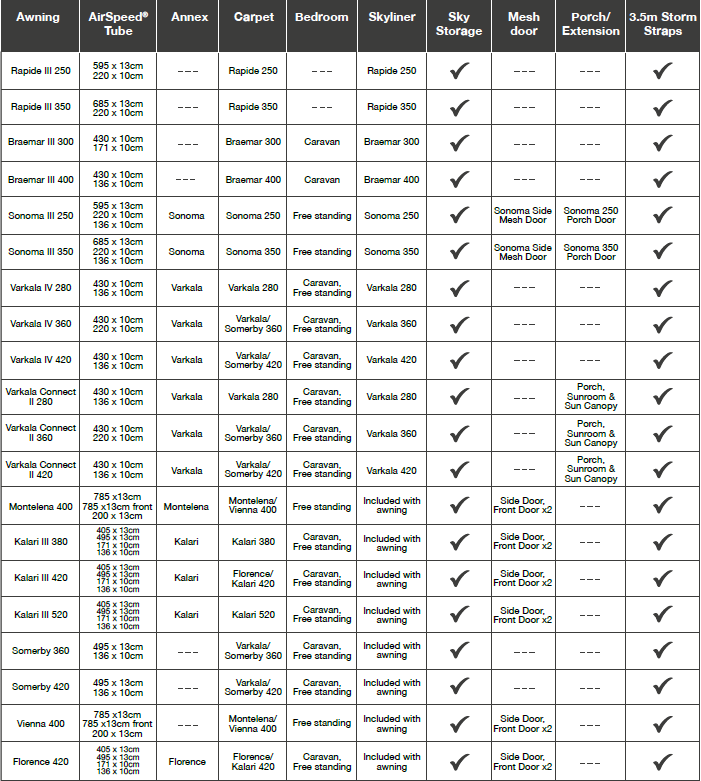 Available for Sonoma, Kalari, Montelena, Varkala Connect and Florence. Additional bedroom inner to accommodate for extra guests. 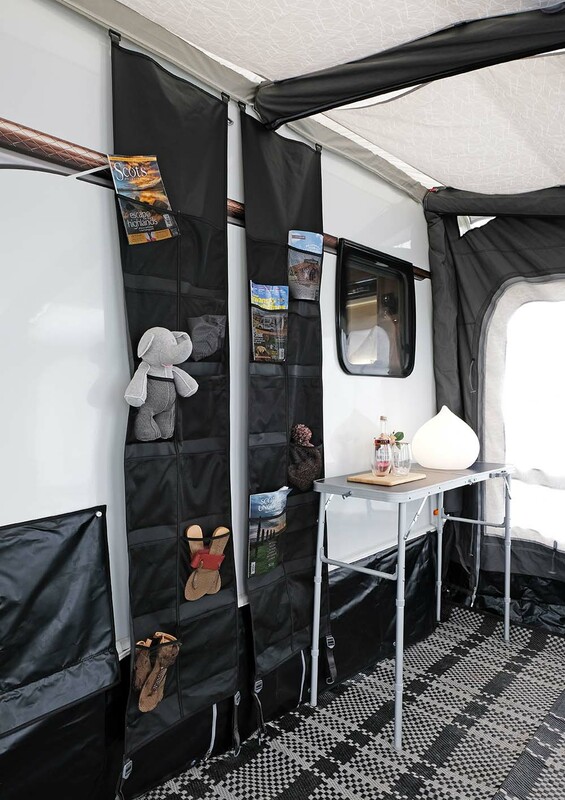 Don’t worry about space inside your caravan for extra guests with the caravan bedroom inner, which can be easily attached inside your awning, or detached when not in use. The bedroom inner is fully-sewn in, breathable and has mesh at the top of both doors so that you remain comfortable throughout the night. 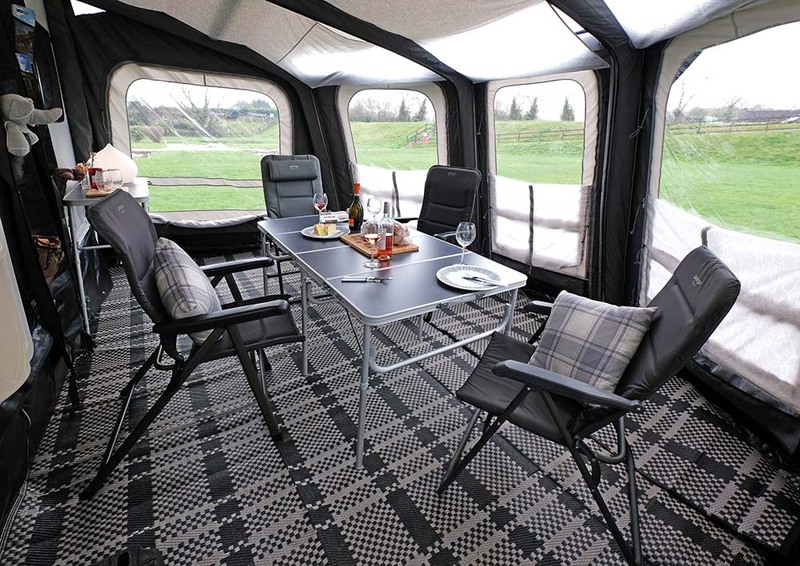 It is available for the majority of caravan awnings including Braemar, Varkala Connect, Kalari, Somerby and Florence. Mesh doors can be zipped onto your awning to replace the doors for ventilation. 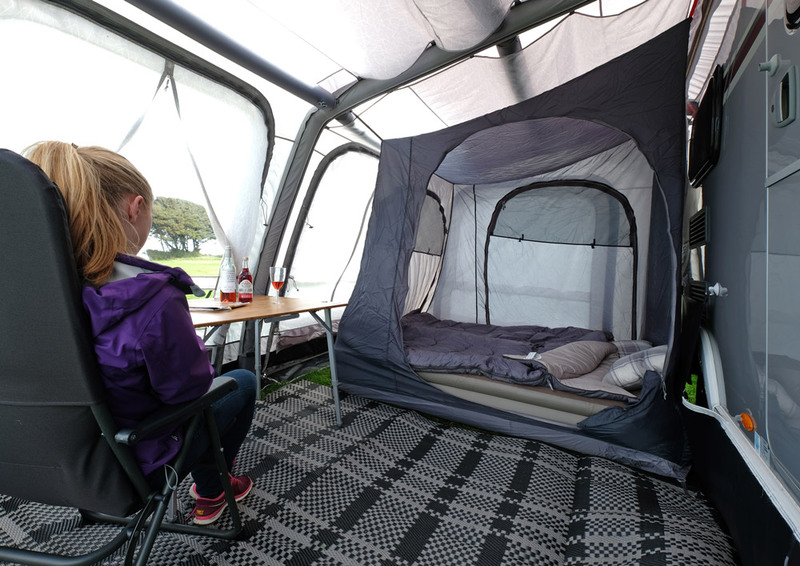 Vango mesh doors are designed to enhance the ventilation within your awning, ensuring you have a flow of air yet making sure bugs cannot enter. There are mesh doors available for the Kalari, Sonoma Florence, Montelena and Vienna, all made to measure for a quick and easy fit. What additions are available for my awning?